Alumawood patio covers are great low maintenance options, but nothing is perfect. 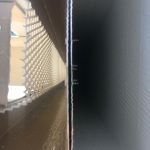 One problem is the roll-form gutters getting backed up. The problem is they are hard to clean out. 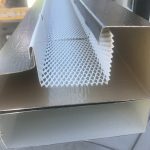 There is a gutter guard that can be used to help stop debris before it gets inside the gutter. 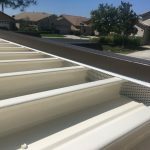 Most jobs don’t have it because it is an extra cost and hard to get people to pay more for something when they are shopping for the lowest price or don’t understand the value of the gutter gaurd. 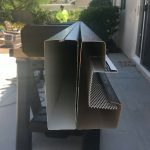 For those of you out there who already have an Alumawood patio cover these could be installed but disassembling the wrap kit/ gutter and inserting the gutter guard. Then just put everything back together and you will enjoy knowing you wont have as much problems with clogged gutters. If you are shopping around for Alumawood then be sure to ask you contractor if they know about it. If they dont just send them to our shopping cart where we will have it for sale in 3′ sections or boxes of 30-3′ sections. Hope this helps and below are some pictures we took during an install to help you visualize how this works.